When we breathe, oxygen gets into our bodies. Every day about 2,000 gallons of circulating blood travel through an estimated 60,000 miles of blood vessels which link all the cells and organs of our body. Oxygen is traveling in that circulating blood. How does it move from our lungs to other places, like the brain? This video clip provides an animated overview of the process. All cells need oxygen to live. Freely available in the air around us, oxygen is the essential fuel to help cells stay alive and carry out their jobs. How does oxygen reach our body’s cells? It follows a systematic transportation route which depends on another substance called hemoglobin. Delivering the oxygen to cells throughout the body. How does a person's body uptake oxygen? Blood flows through our bodies via fine capillaries in the walls of our lungs’ air sacs. Those air sacs are called alveoli. The oxygen molecules undergo a change once they are inside the body. They change from gas molecules, which circulate in the air, to dissolving into a solution within the blood's plasma located within the capillaries of the alveoli. Once those dissolved oxygen molecules are in the solution of the blood, 98% of the dissolved oxygen is taken-up by red blood cells which are passing by. The other 2% of the dissolved oxygen remains in the physical solution. Red cells are great vehicles for transporting the dissolved oxygen. That's because red blood cells contain a special oxygen-binding protein known as "hemoglobin." 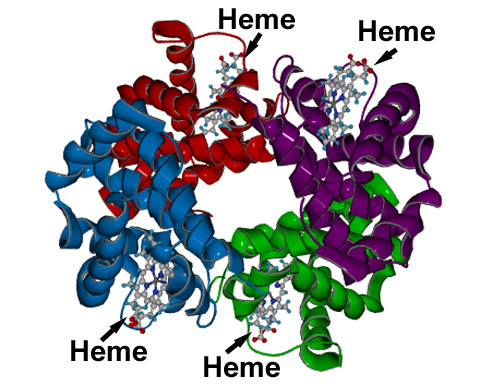 Each hemoglobin molecule contains something else which is important for transporting oxygen: Four molecules of "heme," which is an iron-containing pigment capable of binding oxygen loosely and reversibly. The four heme groups are displayed in this graphic (from Washington University's Department of Chemistry). When hemoglobin is fully saturated with oxygen, its color is bright red, and it's called "oxyhemoglobin." When hemoglobin is not fully saturated with oxygen, its color is purplish-blue, and it's called "deoxyhemoglobin." It is the "heme" in hemoglobin which makes it possible for red blood cells, which are passing by, to pick-up oxygen dissolved in the blood and then transport it. Combined with hemoglobin, the dissolved oxygen is then released back into the blood as oxygen in solution. Now it is ready for delivery to various cells throughout the body. Hemoglobin gives-up its oxygen as red blood cells travel through capillaries in tissues where there is a low content or partial pressure of oxygen. The partial pressure of oxygen represents the level of dissolved oxygen in plasma. Reach the cells, which need oxygen to survive and thrive. Hemoglobin, thus, plays a really important role in transporting oxygen from its entry point in the human body to the cells which put the oxygen to work. Clip from a Fairfax Biology documentary on how blood and oxygen are transported throughout the body. Online, courtesy Fairfax Biology's Channel at YouTube. Bos, Carole "Breathing - How Oxygen Travels in the Body" AwesomeStories.com. Apr 17, 2013. Apr 20, 2019.